You can easily add a link to a webpage to any message in Mail. 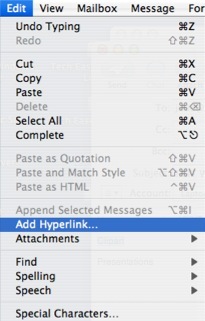 To add your hyperlink, select some text in the body of the message you are composing, then select Edit, Add Hyperlink. Enter the URL of the webpage you want to link to, then click on OK and your hyperlink will be created. 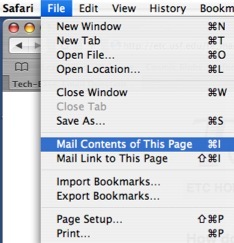 Mail works with Safari to enable you to easily mail links to pages you are viewing in your web browser. To email a webpage in Safari, select File, Mail Contents of This Page or Mail Link to This Page. Either option will automatically open Mail so that you can address the message that will include the link. The difference between the two options is that the second one will only include a hyperlink, while the first will include the webpage itself in the body of the message.